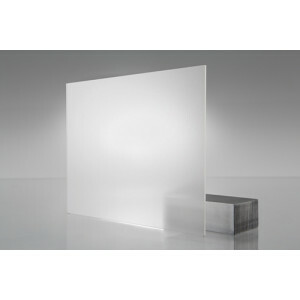 Our Frosted acrylic sheet is a high-quality, durable product. Frosted acrylic sheets have a matt-finish on both sides which give it a similar effect to sand-blasted or acid-etched glass. The light defusing effect of this acrylic makes it ideal for a wide range of applications where clear and coloured acrylic is not suitable. Acrylic sheet has outstanding weatherability and formability, and can be formed into a variety of shapes making it ideally suitable for many end users such as illuminated signs, point of sale displays, furniture, skylights and architectural glazing. FREE cutting service*: Just tell us how you want it cut when you checkout in the special instructions box. Minimum width of cut is 75mm. Saw width is 3mm. Cut sheet has a Tolerance of +/-1mm.